"By unanimous vote, the petition for review is denied." Case link: Mallano v. Chiang, et al., S250379. "...six judicial officers are assigned to act as justices of the Supreme Court in this matter" Case link: Mallano v. Chiang, et al., S250379. "The justices of this court, having determined recusal is appropriate in the present posture of the above-captioned matter, hereby recuse themselves." Case link: Mallano v. Chiang, et al., S250379. The Supreme Court of California has reappointed Judge Catherine D. Purcell as presiding judge of the State Bar Court. The court also appointed Ms. Manjari Chawla as a hearing judge for San Francisco. They will serve in their respective roles for six-year terms, beginning November 1, 2018 and ending October 31, 2024. The Supreme Court of California announced the reappointment of Attorney Jason P. Lee and the appointment of Deputy District Attorney Brandon N. Stallings to four-year terms on the State Bar Board of Trustees. The court also appointed Mr. Lee as chair and Attorney Alan Steinbrecher as vice chair of the Board of Trustees for one year terms. The court appoints three members to the Committee of Bar Examiners, as well as James Fox as chair and Esther P. Lin as vice chair. These are first-time Supreme Court appointments pursuant to Cal. Rule of Court 9.4, which became effective Jan 1, 2018. The court has announced the appointments of Judge James Bianco, Judge Laura Halgren, and Judge Lisa Lench to the Supreme Court Advisory Committee on the Code of Judicial Ethics. Effective May 1, 2018, the Supreme Court has revised its eFiling Rules expanding electronic filing into original proceedings in criminal and civil cases. The Supreme Court of California provided a comprehensive explanation of its understanding of the nature of its procedures for considering requests for recommendations concerning applications for pardon or commutation (article V, section 8). The Supreme Court Advisory Committee on the Code of Judicial Ethics seeks public comment on seven proposals to amend the current California Code of Judicial Ethics. The deadline for comments is May 31, 2018. Special Master Administrative Presiding Justice Elwood Lui filed his quarterly report (October 1, 2017 – December 31, 2017) regarding In re Attorney Discipline System; California Rule of Court, Rule 9.9, S237081. Effective February 1, 2018, the Supreme Court has revised its eFiling Rules to implement electronic filing for all petitions for writ of habeas corpus in proceedings under California Rules of Court 8.380-8.385. The Supreme Court appointed Mr. Michael Colantuono as chair and Mr. Jason Lee as vice chair of the State Bar Board of Trustees pursuant to section 6021 of the Business and Professions Code. Special Master (now Presiding) Justice Elwood Lui filed his report Regarding State Bar’s Request for Release of Surplus Funds with the court on January 10, 2018. This action is in relation to In Re Attorney Discipline System; California Rule of Court, Rule 9.9, S237081. The Supreme Court of California seeks nominations, including self-nominations, of qualified Court of Appeal justices to fill one upcoming vacancy on the Commission on Judicial Performance (CJP). Nominations period extended beyond previous deadline. Nomination Form. [Closed: Justice Dato appointed]. Supreme Court appoints four new members and the new chair, Judge Holly Fujie, and vice chair, Judge Emily Vasquez, to State Bar Trustees Nominating Committee. Supreme Court order grants expedited approval of proposed amendments requested by the Board of Trustees of the State Bar of California to rule 5-110(D) of the California Rules of Professional Conduct. The court issued an order modifying opinion, denying as moot the motion to vacate or modify stay filed by intervener Californians to Mend, Not End, the Death Penalty—the proposition has become effective. The court's Administrative Order (2017-09-20) states that “Pursuant to this court’s authority over the State Bar, the court hereby orders the State Bar’s adherence to the antitrust policy and guidelines [contained in attached Order]”. The Supreme Court recently amended the Comment to rule 8.1115 of the California Rules of Court, concerning the effect of a grant of review on the precedential status of an opinion, to specifically address the consequences (under subdivision (e)(2) and (3) of this rule) of a subsequent order dismissing review. The court issued an order allowing the submission of an amicus curiae letter by any person or entity relating to the matter In re California Bar Exam, S244281. The deadline for submissions is October 2, 2017. (Case Filings Folder). The court published amended rules, FAQs for mandatory electronic filing beginning September 1, 2017, as part of its phased approach to the implementation of eFiling. The Supreme Court of California has published its Oral Argument Calendar for next year. The calendar highlights the weeks when oral argument will be held in San Francisco, Sacramento, and Los Angeles. It also includes the dates for the court’s weekly conferences and court holidays for 2018. The court published its eFiling rules that will support the launch on Monday July 10, 2017 of its electronic filing system. The court has adopted a phased approach to the system’s implementation, which will initially be voluntary for filers, but become mandatory on September 1, and reduces the related number of paper copies required to two. Read more. The changes to the Rules on Law Practice, Attorneys, and Judges section of the California Rules of Court clarify the court’s inherent power and authority. The amendments become effective January 1, 2018. Jorge Navarrete, Court Administrator and Clerk of the Supreme Court of California announced that the Supreme Court will launch voluntary eFiling beginning July 10, 2017, and that the program will become mandatory effective September 1, 2017. Justice Werdegar announced her retirement from the Supreme Court of California effective August 31, 2017, after 23 years on the high court and 55 years of public service. The Board of Trustees of the State Bar of California filed a request in January for the approval of recommended amendments to rule 5-110 and rule 5-220 of the California Rules of Professional Conduct—the request is granted in part and denied in part. Special Master Justice Elwood Lui today filed his Quarterly Report on the Attorney Discipline Fund of the State Bar of California for November 18, 2016 through March 31, 2017. The Supreme Court of California seeks nominations, including self-nominations, of qualified superior court judges to fill one upcoming vacancy on the Commission on Judicial Performance (CJP). Nominations are due Tuesday, January 17, 2017. Nomination Form. The court issued an order for an interim special regulatory assessment that is limited to funding the State Bar's discipline system. Learn about the work of California's high court during its court year September 1, 2015 – August 31, 2016. Multimedia content is included with the summary of key court year statistics. Chief Justice Tani G. Cantil-Sakauye, acting on behalf of the state Supreme Court, today issued an order appointing Associate Justice Elwood Lui of the Court of Appeal, Second Appellate District, Division One, as a special master for In re Attorney Discipline System, S237081. Chief Justice Tani G. Cantil-Sakauye, acting on behalf of the state Supreme Court, today issued an order inviting any person or entity wishing to comment on the State Bar’s Request to submit an amicus curiae letter to the court by Tuesday, October 11, 2016. The Supreme Court has reviewed public comments submitted with respect to proposed Rule of Court, rule 9.8, which involves the proposed disclosure of applicant and examination information by the State Bar. (See the original news release). In light of those comments and after consultation with both houses of the Legislature, the court will defer consideration of the rule. Chief Justice Tani G. Cantil-Sakauye today announced, on behalf of the Supreme Court of California, the appointment of Mr. Jorge E. Navarrete, the court’s current Assistant Clerk Administrator, as the twenty-seventh Court Administrator and Clerk of the Supreme Court. The appointment will take effect Saturday, October 1, 2016. Chief Justice Tani G. Cantil-Sakauye, acting on behalf of the state Supreme Court, today directed State Bar President David J. Pasternak and Executive Director Elizabeth Rindskopf Parker to submit a funding request to the Supreme Court by September 30, 2016. (see Case number: S237081). The Supreme Court of California has published its Oral Argument Calendar for next year. The calendar highlights the weeks when oral argument will be held in San Francisco, Sacramento, and Los Angeles. It also includes the dates for the court’s weekly conferences and court holidays for 2017. Chief Justice Tani G. Cantil-Sakauye announced today that Mr. Frank A. McGuire will retire from his position as the 26th Court Administrator and Clerk of the Supreme Court of California, effective September 30, 2016. The Supreme Court of California has launched a temporary oral argument webcast archive on its section of the California Courts Newsroom. The archive contains captioned video or audio and support documents from its May 3, 4, 5, 26, 27, and June 1, 2 (audio-only) oral argument calendar sessions in San Francisco and Los Angeles. The Supreme Court of California announced today that it has amended the California Rules of Court to eliminate the practice of automatically “depublishing” published Court of Appeal decisions when the Supreme Court grants review. The new rules will become effective on July 1, 2016. The California Supreme Court Committee on Judicial Ethics Opinions (CJEO) has adopted a formal advisory opinion providing guidance to judges and judicial candidates to assist them in determining the types of activities they may engage in at political fundraising or endorsement events. Supreme Court announces the reappointment of Justice Ronald B. Robie, Justice Douglas P. Miller, and Judge Robert J. Trentacosta as members of CJEO. Justices Robie and Miller are also reappointed as chair and vice-chair. In related action, the court adopts amendments to court Rule 9.80 of the California Rules of Court to increase term limits for CJEO members, chair, and vice-chair. The Supreme Court has announced a change to the targeted effective date for possible amendments to the California Rules of Court concerning publication of appellate opinions after grant of review (rule 8.1105(e)(1)) and the citation of such opinions (rule 8.1115). In light of the extensive comments received, and in order to allow appropriate review, the proposed effective date of any new rules is extended from January 1, 2016, to July 1, 2016. The Supreme Court of California Advisory Committee on the Code of Judicial Ethics is seeking public comment on a proposal to amend Canon 4C(3)(d)(iii) and Commentary of the Code of Judicial Ethics. The deadline for comment is December 1, 2015. Rule 9.80 of the California Rules of Court governs the Supreme Court Committee on Judicial Ethics Opinions and the court is seeking comment on a proposed amendment to term limits for CJEO members, chair, and vice-chair by Wednesday, November 18, 2015. The Supreme Court of California has published its Oral Argument Calendar for next year. The calendar highlights the weeks when oral argument will be held in San Francisco, Sacramento, and Los Angeles. It also includes the dates for the court’s weekly conferences and court holidays for 2016. The court appointed Attorney Jason P. Lee to the State Bar Board of Trustees to serve a three-year term beginning in October. The court is considering changes to a rule automatically depublishing Court of Appeal opinions when the Supreme Court grants review. The Invitation to Comment deadline has been extended to Friday, October 9, 2015. The Supreme Court of California will host a Special Student Outreach Session on Tuesday, October 6, 2015 beginning at 9:00 a.m. The students attending will be from the Mandela Law and Public Service Academy in Oakland, and the Advanced Legal Writing Seminar at the University of Southern California. The oral argument session will be broadcast live and Live-Webcast on The California Channel. The revisions adopted by the court include substantive changes relating to campaign contributions, accepting gifts, and judicial candidates. The official bench photograph of the Supreme Court was released today. The new photograph includes the Court’s two newest members, Associate Justices Mariano-Florentino Cuéllar and Leondra R. Kruger, who were sworn into office on January 5, 2015. The Supreme Court seeks nominations, including self-nominations, of qualified justices and judges to serve as special masters for the Commission on Judicial Performance. Nominations are due February 20, 2015. The Supreme Court Advisory Committee on the Code of Judicial Ethics invites public comment on proposed amendments to canons 3, 4, and 5. The deadline to submit comments is January 12, 2015. The Supreme Court of California has published its Oral Argument Calendar for next year. The calendar highlights the weeks when oral argument will be held in San Francisco, Sacramento, and Los Angeles. It also includes the dates for the court’s weekly conferences and court holidays for 2015. The California Supreme Court today released its annual workload statistics for September 1, 2013, through August 31, 2014, the official court year for statistical purposes. Overall, the number of opinions issued by the court decreased from 87 last court year to 83 in 2013–2014. During the same period, the total number of filings and dispositions continued a downward trend in most categories. Supreme Court Committee on Judicial Ethics Opinions advises judges on commenting at public hearings and consulting with the Legislature. Following a national search, the Supreme Court of California today announced the appointment of Mr. Lawrence W. Striley as the 25th Reporter of Decisions of the Supreme Court and the Courts of Appeal. Justice Marvin R. Baxter will not seek re-election as an Associate Justice of the California Supreme Court in the Nov 2014 general election. He will conclude his current term of office and retire on Jan 4, 2015, after 24 years on the Supreme Court and 32 consecutive years of public service. The California Supreme Court today announced the adoption of a new California Rule of Court, rule 9.4, to supplement the attorney oath for new lawyers. Known as the “civility” oath the new oath will include courtesy, dignity, and integrity and is effective May 23, 2014. The California Supreme Court today announced the appointment of four members to the court’s Applicant Evaluation and Nomination Committee, which solicits and evaluates applicants for appointment to the State Bar Court. Justice Joyce Kennard today notified Governor Edmund G. Brown Jr., of her decision to retire from the California Supreme Court after twenty-five years of public service on the state high court, effective April 5, 2014. The California Supreme Court Committee on Judicial Ethics Opinions issued an advisory opinion that provides guidance to family law judges on reviewing applications for non-domestic-violence emergency orders. Effective Jan 1, 2014, rule 8.44 of the California Rules of Court is amended to allow parties to submit electronic copies of briefs and petitions filed with the Supreme Court. The Supreme Court's opinion admits Sergio C. Garcia, an undocumented immigrant, to the State Bar, granting Garcia a license to practice law in California. The unanimous decision was authored by Chief Justice Tani G. Cantil-Sakauye. The Supreme Court committee provides guidance on disqualifications triggered by judicial campaign contributions and also advises on steps for judges to take to ensure that disclosures become part of the record. Supreme Court returns to Sacramento for November Oral Argument Calendar (Oct 11, 2013) The California Supreme Court will return to its Sacramento courtroom in the Stanley Mosk Library and Courts Building for the Nov 5 and 6, 2013 oral argument calendar. The renovation of the building that began in 2009 has created a safer, more accessible, and “green” building—view virtual tour. The court has published the calendar for the October Special Oral Argument Session and the briefs and other filings are available and will participate in a Conference hosted by the California Constitution Center at Berkeley Law in October 2013. (Aug 26, 2013) The Supreme Court appointed Attorneys Miriam Krinsky and Hernán Vera to the State Bar Board of Trustees following recommendations to the court by its seven-member State Bar Trustees Nominating Committee. The terms will commence October 12, 2013, and conclude after the bar’s annual board meeting in 2016. The Committee on Judicial Ethics Opinions invites public comment on a draft advisory opinion dealing with judicial ex parte communications in family law cases. Deadline for comment: Sept 9, 2013. The Supreme Court’s final rulings on these two petitions, which sought orders requiring county clerks to enforce Proposition 8 (confining marriage to a union “between a man and a woman”), are now available. The court denied the petition in Hollingsworth and granted the request for dismissal in Dronenburg. The California Supreme Court Historical Society’s most recent newsletter profiles the work of the court in a number of articles. Some of the topics covered include the women justices on the bench, the court’s outreach sessions, and a profile of the Clerk/Administrator. The California Supreme Court’s State Bar Trustees Nominating Committee is seeking qualified applicants for the court’s two appointments to the State Bar Board of Trustees in 2013. The deadline to apply is March 29, 2013. Application Form and instructions. As part of the court’s ongoing outreach efforts, students from Campolindo High School in Moraga, Head-Royce School in Oakland, and Fresno City College, as well as law interns from the San Francisco City Attorney’s Office, will each be attending portions of the court’s oral arguments on Tuesday, March 5 and Wednesday, March 6. The Supreme Court of California announced the creation of a seven-member State Bar Trustees Nominating Committee to assist the court in selecting appointees to the State Bar Board of Trustees. The committee’s organization and work will be guided by Rule 9.90 of the California Rules of Court, which the court adopted on January 23. 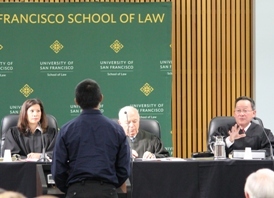 More than 200 attended the Supreme Court of California's historic special session at the University of San Francisco, School of Law. The session commemorated the centennial of the university’s law school and kicked-off a month long effort launched by Chief Justice Tani G. Cantil-Sakauye to bring legal and civics learning into the public eye. The California Supreme Court appointed three new members and reappointed two current members to the Supreme Court Committee on Judicial Ethics Opinions, an independent committee appointed by the court to help inform the judiciary and the public concerning judicial ethics topics. As part of the California Supreme Court’s ongoing outreach and education efforts, the court will welcome more than 100 students and teachers from Sacramento’s C.K. McClatchy High School to hear the two morning cases on the court’s February 6, 2013 oral argument calendar in San Francisco. Beth Jay, who has significantly influenced the administration of justice of California while serving as the Principal Attorney to three Chief Justices of California over more than 25 years will retire at the end of the year. She has been a leading voice in the evolution of Supreme Court and judicial branch issues. The Supreme Court has adopted amendments to the Code of Judicial Ethics concerning such topics as disclosure of campaign contributions and loans in judicial elections, conduct by judicial candidates, ex parte communications, conducting settlement conferences, and grounds for disqualification of judges. The Kalmanovitz Appellate Courtroom at the University of California at Davis School of Law was filled to capacity on Oct 3 for the Supreme Court of California's special oral argument session. Case summaries and related information are available here. Frank McGuire is currently the managing attorney for the administrative presiding justice of the First District Court of Appeal and has spent more than 20 years working in the appellate courts. This case concerns whether an undocumented immigrant who has graduated from law school and passed the California bar examination may be admitted to the California Bar or whether such admission is precluded by any federal statute or for any other reason. The Supreme Court is seeking applicants for court’s first-ever appointment to State Bar Board of Trustees, which oversees the State Bar of California. The deadline to apply is June 1, 2012. After a 47-year career in the state justice system, Mr. Frederick Ohlrich will retire as Clerk/Administrator of the California Supreme Court.